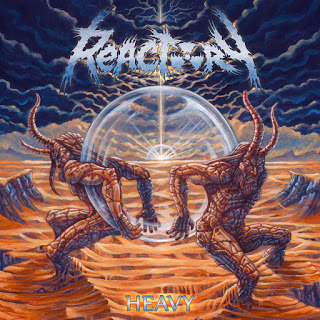 Continuing to charge through the underground, German thrashers Reactory have spent the better part of their young career honing and refining their dedication to the old-school thrash scene by building their skills on the live circuit. Taking a two-year gap between releases, the group’s second full-length effort was released July 22, 2016 on new-label F.D.A. Rekotz. As was a part of their previous efforts, the groups’ foundation to be found here is simply charging and explosive old-school inspired thrash. This one features tracks like To Thanatos (Fumigation from Manna), Deep Tranquility and Angstharsis that go from solid, crunchy mid-tempo charges with straightforward patterns and heavy arrangements while still breaking out the solid and rousing thrash energies throughout which are nicely integrated into the remaining sections of the album that really push more explosive elements forward. Those elements come from efforts like Shrines of the Forgotten Gods, Monolith and Let Me Rage Before I Die are the more fuller and more rounded thrashing on display which generates more of a speedier series of rhythms rather than just the simple plodding rhythms on display more frequently here as these fire up more prominent riffing and pounding drumming that doesn’t appear elsewhere here which really highlights the main issue with this one. There’s just not nearly enough of a series of ravenous thrashing on display here which is dropped in favor of the straightforward mid-tempo elements and it causes a severe lack of energy at times with it abandoning the thrash in favor of the simplistic elements. It really brings this one down enough compared to before.